Thanks. Enjoy your pleasant weather Annette. Thanks for joining in today Susie with a very seasonal offering. 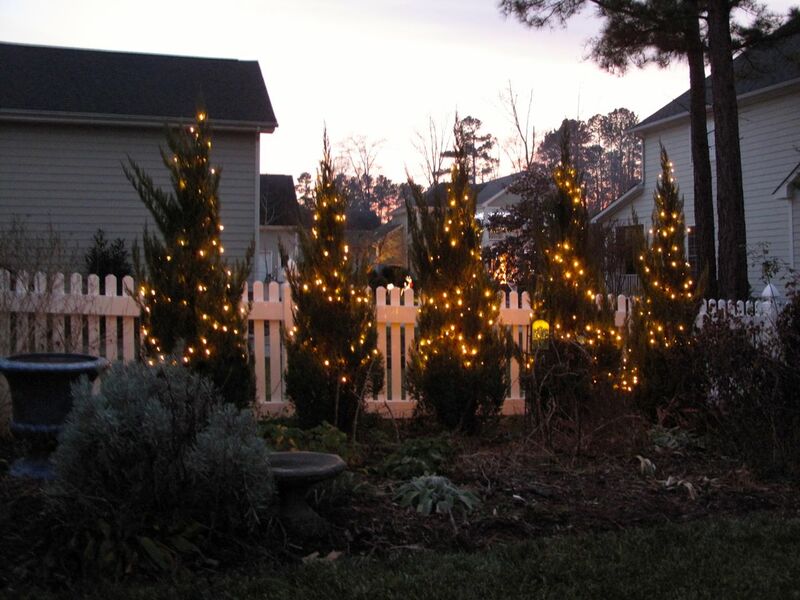 The cedars a are a lovely focal point to your garden. I hope you will manage a comment on my post, I used my iPad to do the post and I’m not sure it is responding in a totally normal way! Hi Christina. I added a comment this a.m. and it worked fine. Hope you are enjoying your U.K. vista. The warm weather just seems weird to me. I liked all the snow we had and was looking forward to a white Christmas. Snowdrops are popping out of the ground hopefully not to get frozen later. The bright side is that my camellias are blooming again. Wow what great weather…warmer here but not that warm…happy Solstice. Happy Solstice to you too Donna! Happy holidays, Susie! Your garden looks very festive! Thank you Marian. Good holidays to you as well. We just arrived in Austin – 39 degrees when we got off the plane last night.I like the lights! Enjoy the holidays! Thanks Jason. Hope you enjoy Austin!